When the kids were considering Halloween costumes, The Fonz wished Harry Potter’s invisibility cloak existed so he could go as the invisible man. I told him I’d actually read a story about scientists developing an invisibility cloak and he grew excited. I didn’t answer. Part of me was annoyed that he wouldn’t stop asking. The other part remembered what it was like to be seven and knew he was imagining impressing all his friends and playing pranks like making his teacher’s books appear to be floating in mid-air, and I really wanted him to have that invisibility cloak. Does anybody know how much they cost and where I can buy one. It means you have to change your shirt. 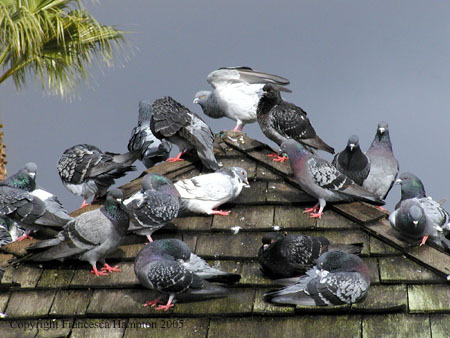 Pigeons sitting on top of your house is usually symbolic of poop literally sitting on top of your house. Only one day left to vote in the caption contest. The winner will be announced at 6AM EST, but if you’re planning your day around the announcement, make sure you know tomorrow is the daylight savings time change in many places. I don’t want anyone complaining I threw off the entire weekend schedule. If it makes you feel any better, I don’t remember any party so I guess I wasn’t invited to my party either. Hell, I want an invisibility cloak, as well. Think that will help me avoid the pigeons perched and pooping on my roof–not to mention, find a way around daylight savings time? Now how much do they cost again? I’m guessing about a million dollars, but I’m pretty sure you can make that money back pretty quickly once you get the invisibility cloak. I suspect the complication for your cloak hunt will be that you are possibly assuming that you buy invisibility cloaks from visible people. The search for a seller will be difficult in my opinion if my suspicions are correct. I wish I’d told him that. Actually, I’m going to tell him that right now. Hilarious, Ape No. 1! And so wise. I come to this blog for all the latest info on invisibility and cloaks. Ahhhh “I don’t know. Maybe a million dollars.” As soon as you put a price on it, it existed. What a wonderful boy that Fonz not giving up on his quest. Now his relentless goal will be how to get a million. I’ll get excited once I’m certain he doesn’t just plan to search for the million dollars under sofa cushions. If Georgette is right, you may have inadvertently sparked Fonz’s entrepreneurial spirit. He may be the next Donald Trump (but with better hair, I assume) or Bill Gates. Looks like you won’t have to save for retirement. Nice going. It’s amazing how determined kids can be. Your 7 year old sounds like my son. If mine knew about invisibility capes we would never hear the end of it. You’re raising quite the intrepid consumer, there! When he collects that life insurance money, hope he comes back to the states and fuels our economy! Maybe The Fonz and I can pool our money together to buy an invisibility cloak. What’s that? You say it’s not for sale? But what if we throw in some Halloween candy to sweeten the deal? How about now? I saw this article on Shanghai in the Smithsonian Magazine and thought you might be interested. I have ALWAYS wanted an invisibility cloak! Greatsby…. (take a sip) where can I buy one? How much will it cost? PS: Watched a show about a couple looking for a house in Shanghai last night to rent…they ended up looking at three. One in the middle of downtown and two in the country. They had a budget of $5,500 per month….and that is what it cost them. WOW! ….they moved from TEXAS! It was really interesting and I thought of you. I wish every imaginative seven-year-old could have an invisibility cloak or a flying carpet, because that’s the age where you KNOW just what to do with such things. Oh, yeah, wouldn’t they have a blast? You’re absolutely right. I’d have a thousand uses for invisibility as a kid, but I can’t think of much I’d do with it now. I don’t know where you can find an invisibility cloak, but I’ll be happy to sell you an invisible cloak for just $900,000. I didn’t get my invitation to your party either. If I’d had an invisible cloak, I would have crashed it. Just tell your son you found a moderately priced ($764,878.00) Invisibility Cloak online, and it’s in that (empty) box on the counter. When he opens it and sees nothing, you can assure him it’s there. When he excitedly puts it on,you now have the added advantage of being able to ignore him, maybe for hours on end. You could mention this one also comes with a “mute” feature (that appears to broken and is always on) so he’ll have to adjust for the fact that you can no longer hear him, either. You win points and can now sit on top of him when he dares to recline in your favorite chair. And you are not required to react to his cries of agony, either. That’s perfect. Yesterday I did try and introduce him to the invisible creator of the invisibility cloak. I heard a rumor that you can only acquire an invisibility cloak if you’re really good at solving riddles and distracting trolls. 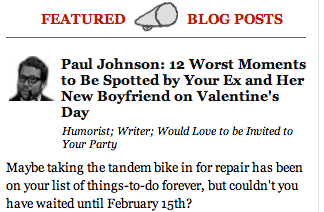 On second thought, I think maybe Pauly Shore has one. Zing! Take that Pauly Shore. Can always distract a kid with video games. Spectra has the perfect solution! I think we both went to that party. I don’t recall it either, but there’s a few hours of my life I can’t account for. Either that, or my random blackouts are ret………………..
I’m sorry, what were we talking about again? IF it were for sale, could you buy it, use it with the tags on and then return it for the million bucks back? ^^ Now THERE’S some savvy shopping! If you still had the receipt and the cloak was “like new”, I don’t see why not… There’s gotta be a 30-day return policy, right? It’s often said that “No one can tell if you are a dog on the Internet,” but it’s also true that no one can tell if you are invisible. I would like something to make the pigeon poop on my balcony invisible! Oooh the things one could do with an invisibility cloak! I was at your party..I just can’t remember it..I just remember drinking out of a punch bowl…. That cloak rocks! As did your post!